In the 1960s, when her children were young, Joan Firey had little time to practice physical therapy. Beyond raising children and climbing, she found satisfaction in painting. Joan's aunt Edith Hamlin and uncle Maynard Dixon were renowned painters in the 1930s and 1940s. With little formal art training herself, Joan did her finest paintings in the 1960s and early 1970s, when she and Joe were most active in the Pickets and B.C. Coast Mountains. In the book Cascade Voices, her friend Piro Kramar recalled that Joan belittled her realist paintings somewhat, feeling that they weren’t “original.” She tried her hand at abstract modes of painting, but the works her friends know best are her exquisite paintings of mountain scenes. Most of these paintings now hang in the homes of family and friends. Joan painted with oil in the early 1960s then switched to acrylics, finding it more convenient. In the late 1960s and early 1970s she started doing silk screens. As the Firey children grew older, Joan resumed part-time work in physical therapy and became increasingly involved in the mountaineering community. She edited the Mountaineer Annual for several years, was active in governance of The Mountaineers and American Alpine Club, and did draft planning for the North Cascades National Park, which was established in 1968. During the 1970s, Joe and Joan grew apart both as climbing partners and as a married couple. After a period of separation, they were divorced in 1978. Joan remained passionate about climbing, and while she had always held her own in any climbing team, she grew interested in not just leading pitches, but in organizing entire trips on her own. She also wanted to complete trips that were organized and carried out by women. Irene Meulemans and Piro Kramar were two of Joan’s favorite companions on these trips. 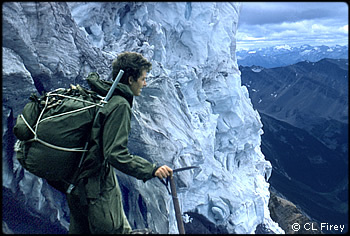 Joan’s finest climb was probably the 1974 first ascent of the NW Face of Mount Asperity in the B.C. Coast Range, completed with Piro Kramar. Joan became interested in international climbing as well. In 1976 she climbed in Peru with R.D. Caughron and four others and on another trip she climbed some of the Mexican volcanoes. In 1978 Joan was the senior member of the American Women’s Himalayan Expedition to Annapurna, organized by Arlene Blum and documented in the book, Annapurna: A Woman’s Place. Joan developed pneumonia and pleurisy during the expedition, but still carried loads to Camp III and helped manage the lower camps. The expedition placed Irene Miller and Vera Komarkova on the summit, accompanied by Sherpas Mingma Tsering and Chewang Rinjing. Joan’s friend Piro Kramar abandoned her summit bid at the highest camp due to frostbite. Tragically, the second summit team of Alison Chadwick-Onyszkiewicz and Vera Watson perished in a fall between Camps IV and V.
According to her daughter Carla, Joan never felt completely well after the Annapurna expedition. In the spring of 1979 she was diagnosed with malignant myelosclerosis, a rare bone marrow disease. Her doctors gave her three months to a year to live. The last outdoor trip she made was to the Colorado plateau in the spring of 1979. She died on February 16, 1980. During the summer of 1981, Joan’s ashes were scattered from the air over Picket Pass, in the heart of her beloved Picket Range.